I made risotto for dinner on Friday night. With a radicchio begging to be used and a squash screaming at me that the end was nigh, I figured this was a good solution. I shredded the radicchio, diced my kabocha, chopped my onion and heated my oil. Things were going swell until I went to my pantry to discover I was out of arborio rice. I’m never out of arborio rice. But then I remembered my husband needed to rescue a damp BlackBerry a little while back, and my stash of short grains was sacrificed for the cause. Enter the understudy Millet to play the role of arborio rice. I had no barley, either, so it was all on this pearly grain. It stepped up but know that millet risotto takes forever if you run into a similar situation. For. Ever. Saturday I set about to make Hippie Bread from Adrienne Kane’s United States of Bread. This book is a definitive one on all things bread, buns and crackers. And as I scanned the ingredient list (which actually called for millet), I noticed I’d have to find a substitute for the sunflower seeds. No worries. I had pepitas that could tag in. So on I went, moving between my pantry and mixing bowl with one ingredient at a time. Cue the ‘Oh $#!%’ moment when I realized I didn’t have wheat germ. Sifting through my pantry, I found Ontario Romano bean flour. It’s gluten-free but it does have all that protein and loads of iron, which is why I figured wheat germ had a place in this recipe. I crossed my fingers that I wasn’t upsetting the baking gods too much and dumped it in the mixing bowl. Then along came whole wheat flour. Sigh. Must remember that brilliant French idea, Tiff: mise en place. I chided myself for forging ahead with a recipe two days in a row without first confirming that I had everything I needed. Novice mistake, really. Enter my newly acquired sack of red fife wheat flour from a mill in Medoc. Turns out red fife, a heritage variety of wheat that has less gluten than today’s editions, is typically stone ground, so the germ and the bran stay in tact. If only I’d known when reaching from the Romano flour. But hey, the more protein and fibre the better, right? I ripped the stitches on the bag, officially made it part of the cast and continued hoping for the best. As it turns out, being forced to improvise on the fly can have some incredible results. The bread had a rise to it like Everest and came out of the oven soft, with a almost a pumpernickel hue from the molasses called for in the recipe. It had a dense crumb that could stand up to the coldest, hardest butter, and best of all, it tasted fabulous. It’s the heavyweight of bread, to be sure; a body-builder compared to the leaner, lighter loaves I’ve made. It’s meant to be sliced thickly, emphasizing its heft. It begs to be slathered in peanut butter and jam. Or that butter I forgot to let sit outside of the fridge to soften just so, and some creamed honey. Either way, it keeps me going for hours. The generally accepted rule of recipe writing is that three changes to the ingredients make it original, so I’m putting it on the blog. But I can’t do it without giving full credit to Adrienne because if it weren’t for her Hippie Bread, there wouldn’t be my Hipster Bread, as I’ve come to call it. A natural evolution, no? 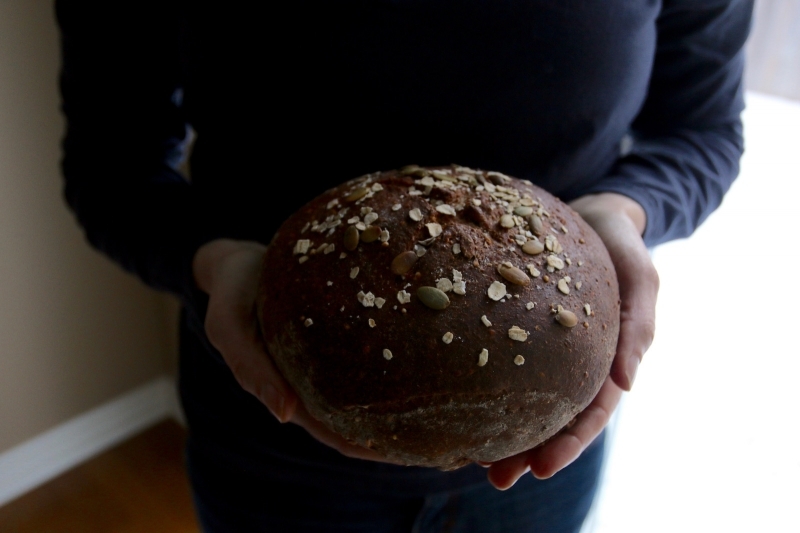 Besides, using a gluten-free flour and red fife that comes in a stamped cotton bag puts this bread comfortably in the hipster — modern-day hippie — realm. Best of all, I know for certain I have all the ingredients handy for the next time I make it. I’ll just have to wear plaid when that happens. This makes a dense, slightly sweet bread that takes on a dark colour when baking. It’s the perfect breakfast bread and stands up well to hard butter and creamed honey. Despite its density, this bread is not dry. Slice it thickly for maximum oomph. Put 1/2 cup oatmeal, 1/2 cup pepitas, millet, Romano bean flour and salt in the bowl of a stand mixer outfitted with a paddle attachment, and add the hot water. Mix in the oil, molasses and honey, stirring until combined. Set aside and let cool until warm. In a small bowl, mix the warm water, yeast and sugar. Set aside for 10 minutes to bloom and become almost milky. Once the grains have cooled, add the red fife flour to the stand mixer bowl and mix at a low speed until ingredients are just combined. Add the yeast and mix briefly before adding 1 1/2 cups of all-purpose flour. Continue mixing at a low speed until ingredients are well-blended. Remove the paddle and attach the dough hook. Begin kneading with the hook at a low speed, adding the rest of the flour, 1/4 cup at a time. As the kneading continues, the dough will become more cohesive and elastic, pulling away from the sides of the bowl. The trick here is to ensure all the flour gets mixed in without the dough becoming too sticky or dry. Stop the mixer after half a cup of flour has been added to check the dough. You want it to be tacky rather than sticky. If it’s sticky, continue adding remaining flour until you achieve that tacky feel. Once you have it, knead for 6 to 10 more minutes. Empty dough on a floured surface, scraping out any bits of dough and adding them to the pile. Gently knead the dough by hand into a ball. Put it back in the bowl, cover the dough loosely with plastic wrap, and place it in a warm spot. Let it rest for 1 to 1 1/2 hours, or until it’s doubled in bulk. Remove plastic wrap and dump the dough onto a floured surface. Fold the dough once in each direction to release gases. Cut the dough in half, forming portions into a loaf (I rolled one portion of dough but feel free to fold it. I formed the second portion into a round). Tuck the ends of the rolled or folded dough under, press seams together and place in a loaf pan. If making rounds, place on a baking sheet. Cover with plastic wrap and let loaves rise for another hour or until doubled in bulk. If using a loaf pan rather than rounds, the dough should be nearing the height of the lip of the pan. Arrange oven rack in the middle of oven and preheat to 190°C (350°F) for 15 minutes before baking. Just before baking, remove plastic wrap, slash the loaves with a thin blade, then brush lightly with water. Sprinkle loaves with remaining tablespoons of oats and pepitas. Place them in oven on middle rack and bake for 40 to 45 minutues, turning pans once, halfway through. Remove the loaves from oven and set on a cooling rack for 5 minutes. Release the loaves from pans and let cool to room temperature (if you can wait that long) before eating. Grab the cold butter and enjoy. You can get your own stamped sack of red fife wheat flour from Medoc at The Peanut Mill in St. Catharines, or the Bulk Barn if the stamped sack doesn't impress. My Ontario Romano bean flour came from FoodiePages.ca.